Sand Castle III #502 is a 3 bedroom beach front condo on Sand Castle III Indian Shores Beach that can be rented Saturday to Saturday through this page. Located between Clearwater Beach and Madeira Beach by owner. Indian Shores vacation rentals are the cleanest and most updated, since they are managed directly by the owner, someone who really cares. Please call me, the owner if you have any questions about my Indian Shores Beach Rentals. Fully Updated and Stylishly Decorated three bedroom beachfront condo fully stocked with everything you could possibly need. This condo has been owned and managed directly by the owner since 2001 and it shows! *** FREE PERKS!!! Beach Umbrellas, Beach Chairs and Big Beach towels are all provided!!! Unobstructed Sunsets will be yours to view from our luxury beachfront condominium's oversized balcony. Enjoy the warm Gulf Waters and the pristine white sandy beach! I've been managing my own condos since 2001. Seven miles south of Clearwater and nine miles north of St. Pete Beach, this three bedroom/two bathroom condominium is on the Fifth floor of a quiet and intimate 25 unit building. Professionally Redecorated recently in Comfort and Tasteful Florida Style! This is decorated very luxurious, more as a 2nd home, rather than a rental. It has all new furniture throughout with gorgeous tile in the main living areas! The Heated Swimming pool and Hot tub are right on the beach with beautiful Gulf views. There are poolside BBQ Gas Grills and Tables for outdoor fun. 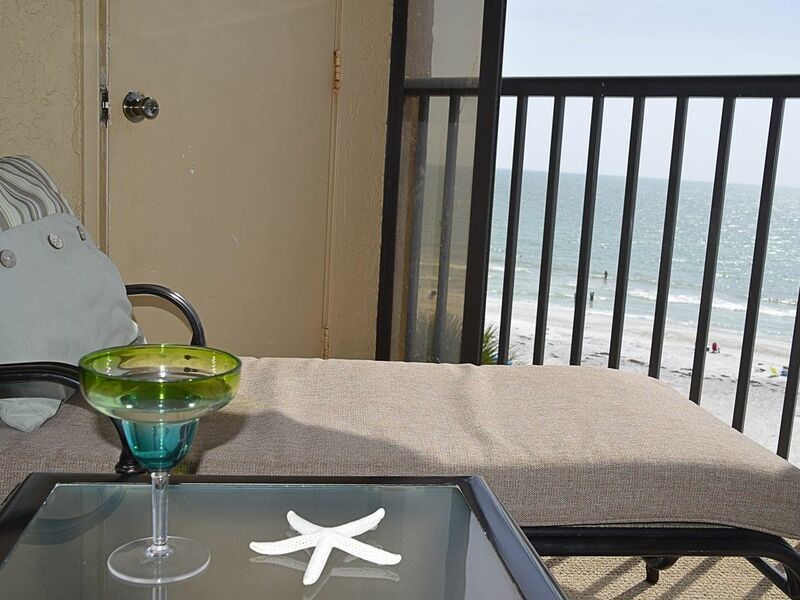 Our unit, "Sand Castle III," has a spacious balcony that directly overlooks the Gulf of Mexico and white-sandy beaches. Luxury, Plush King bed in master bedroom, King and Twin beds in second bedroom, Two Twin beds in third bedroom, and a twin rollaway. Relax in the New leather livingroom set with the oversized sofa, love seat, and large chair after a tough day at the beach! There is a full-size washer and dryer, and a kitchen with all appliances and cookware available. There is also a wetbar in the living room. Disney World is only one and one-half hours, Busch Gardens is a 30-minute drive, and it is 30 miles to Tampa International Airport. Great seafood! Many wonderful restaurants within walking distance! Shopping and Boating at John's Pass! Many attractions! Ninety minutes to Disney, Sea World, and all of the attractions that are in Orlando and Kissimmee! Cool new feature: Sun Coast Trolley will take you from St. Pete Beach to Sand Key (Clearwater) daily with unlimited stops for one price! - Over-size beach front balcony seats up to nine for entertaining and breathtaking views. - master opens to the beachfront balcony with fantastic views! Here's my cancellation and reservation policies... 60 days prior to arrival with 100% refund (minus $200 cancellation fee and travel insurance if purchased) and 30 days prior to arrival with 50% refund (minus $200 cancellation fee and travel insurance if purchased) . 25% of the grand total will reserve the condo, accepting all forms of credit cards. The balance is due 30 days prior to arrival. I'm a local and raised my family here. I've been an owner and have been managing my own condos since 2001. Since I am the owner and have been managing it myself since 2001, you will see why my condos are a huge step up from any condos managed by a rental company. I accommodate my guests personally, and it shows.